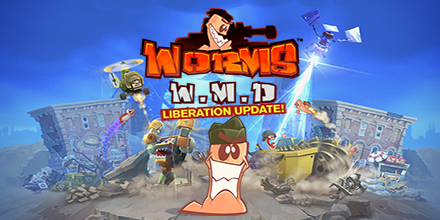 Worms W.M.D Liberation Update – Available now! This is the biggest update to hit Worms W.M.D since launch and we’re really excited to hear what you think. – Over 10 brand new buildings specific to the new Liberation update, which also include Bunkers and Tunnels. Fear not console players, we’ve got a big balance and bug patch coming your way before Christmas that’ll put you on par with your PC based gaming cousins. – Added a new ESL scheme to allow players to easily practise this scheme between tournaments. – Reordered the scheme list to bump the most popular schemes up the list. – Crate drop speed has been increased to allow for faster turn transitions. – Increased the spread of the chained payloads from the Banana Bomb and Super variant. – Reduced damage output of the Helicopter and made it more difficult to reach higher damage values. This vehicle’s utility still lies heavily in its mobility. – Vehicle Mine has a vehicle damage multiplier. It is now deadlier against vehicles and not as strong against worms. – Adjusted turn speed and reaction rate of Sentry Gun to allow for easier counter-play with this weapon when ‘trapped’ by it. Also adjusted maximum damage so that this weapon is less of an all-in-one solution and more specialised to area denial. – The Uzi crafted variants have been rebalanced. They were capable of too much damage with very easy to meet conditions to get the best out of them. – The Sheep Launcher has had its launch power increased to allow it to cover a larger area of the landscape. – We have made lots of adjustments to the crafting costs of weapons. The goal of this was to encourage the use of more weapon variations and reduce the cost variance between weapons of similar power/type. Weapon variations that have a small power increase now cost a premium in the first two crafting tiers (Poison Dynamite is a good example of this) , whereas weapon variations that jump up a power band will have a tier 3 or 4 premium added to their cost (Mega Buster is a good example of this). We will be keeping an eye out for your feedback on these changes as we strive to get the best version of the Ranked scheme as possible. – Fixed an issue where users could attack multiple times when disconnecting and reconnecting the ninja rope…oops! Phew, that was a biggy! Thanks for taking the time to check out the patch notes and we hope you enjoy all the new content! Worms W.M.D – Liberation Free DLC & Twitch Reveal Tournament!